Lock in a great price for Rest Full Homestay – rated 9.3 by recent guests! Wonderful little house tucked away in nature but still in a great location walking distance to everything. We were greeted with a delicious pot of welcome tea & snack, had great breakfasts, were given advice on local buses, and rented a scooter through the family. Highly recommend! Peaceful place with many trees around which makes you feel like you are in a forest although it is only five minutes from town center. The hostess is friendly and the breakfast is great. Very nice hosts, cute little dogs! Great location and a beautiful setting. Great breakfast! Really close to the town center. But far enough for it not to be noisy. Friendly staff. Arrived a bit earlier than check in time and they let us go in with no problem. And also brought us tea and delicious rotti. The owners let us park the tuctuc one day before as we took the train from Kandy to Ella and our driver left the vehicle there. Nice place that is run by a family. Little bungalows are clean and comfortable. Lovely puppy. Would have stayed longer if it wasn’t that we had to continue our trip. Our hosts were lovely, accommodating and kind. The breakfast was authentically Sri Lankan and very tasty. The rooms were clean and pleasant. The bathrooms were also very clean with good running hot water. Very friendly owner. We paid more than in previous stay, but room also was much better. Nice balcony. Tasty breakfast. Very good location, near center(no tuk tuk needed), just go little up hil and you are in very quit relaxing place. We liked it! the breakfast was great. the location very homely.. and green and beautiful. access was a little difficult - especially for a car. but this added a charm of its own..
One of our best sellers in Ella! Located in Ella, Rest Full Homestay provides accommodations with free WiFi, within 1.3 miles of Demodara Nine Arch Bridge. Ella Spice Garden is a 7-minute walk from the family stay. 뀐 Located in the top-rated area in Ella, this property has an excellent location score of 9.0! 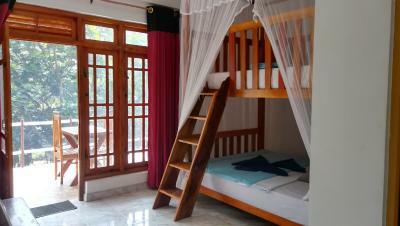 When would you like to stay at Rest Full Homestay? House Rules Rest Full Homestay takes special requests – add in the next step! Great location, super friendly and helpful family, very clean and comfortable accommodation (we had the family room which is a stand-alone small single storey attachment the main house. The only minor comment bus that due to the humidity of the place we had frogs (extremely noisy at night) coming in the bathroom all the time until we finally managed to close the window. Ended up in a funny anecdote. It's in the village but still away from all the noise in a little jungle oasis just around the corner, lovely place. They made everything really easy for us, since the check-in when we arrived one day earlier, to the transfers and tuk tuks we had to book. The breakfast is really nice too. It s just up in a hill. Location is walking distance to center, and no need to take tuktuk every time, also if your not to lazy you can walk to train bridge and adams peak. The host is nice and always ready to help. Since we stay for 3 nights, we have 3 breakfasts and every time it was little different..not just same food every morning. Wifi works fine. Excellent room and facilities. Lovely balcony. Wonderful hosts. Gray aircon and best home cooked food in Sri Lanka. If you stay here get her to make you dinner at least one night. You won’t regret it. Wonderful location in the jungle, a wonderful owner. Delicious breakfasts. Best breakfast, lovely host. Highly recommend! This homestay is close to the center of town Ella, close to the Little Adma´s Peatk, but in the calm part of the towt. Nice garden is in front of the window. Everthing is clean. Service is excelent. Dinner and brekfast? It was the best food what we have ever eat on Sri Lanka. The electricity seemed to cut out for a few hours a day. Location excellent, a steep hill to get up even the tuk tuk struggled. In fact as we were 3 plus luggage we had to get out and walk the last bit. But a short walk to town and en route to the 9 arches and little Adam’s peak.